Hanoi (VNA) – General Secretary of the Vietnam National Assembly (NA) Nguyen Hanh Phuc on August 15 held talks with General Secretary of the Office of the Mongolian Parliament Tsend Tsolmon who is on a working visit to Vietnam from August 14-18. 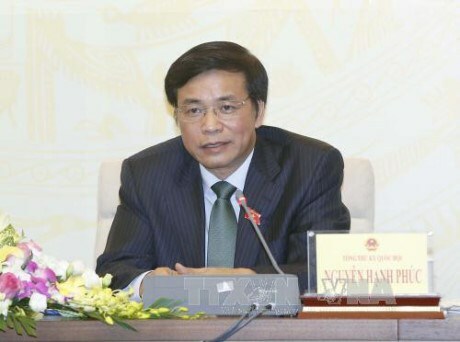 At the meeting, Phuc said the Vietnamese NA appreciated Tsend Tsolmon’s visit to Vietnam, saying he believes that it will help advance collaboration between the two legislative bodies and their Offices in particular in a more pragmatic and effective fashion. Tsend Tsolmon highlighted the fruitful relationship between the two law-making bodies, which, he said, has been demonstrated through the regular exchange of delegations. The guest expressed his wish that the two sides will share experience to promote relations between the two legislative bodies as well as their Offices. At the meeting, host and guest held that Vietnam and Mongolia boast long-standing friendship and cooperation, which have been strengthened over the past six decades. They highly valued cooperation agreements reached by the two legislative bodies and supported the enhancement of cooperation between the parliamentarians’ groups of the two countries.